“The 453-foot Russian-flagged tanker Nordvik is rated to travel in non-Arctic seas in thin ice, but collided with an ice floe in Matisen Straight, causing a hole that resulted in water ingress. The Northern Sea Route Administration had given the vessel permission to sail in the Kara Sea and the Laptev Sea, two of the most northern seas. There are as yet no reports of diesel fuel spills in the area, and the vessel was reportedly traveling toward Murmansk. A graphic of sea ice concentrations shows ice in that region, though the majority of the passage is shown to be ice-free. A Russian union spokesperson said the accident is an example of the need for more emergency response capacity in the region prior to allowing vessels to travel in the Arctic seas. Alaska’s state officials responded with similar concern, saying the incident illustrates why Alaska and the United States need to continue to push an Arctic marine safety and life safety agenda. “We have an Arctic Council agreement signed this year to help each other in cleanup, but need more work in prevention,” said Lt. Gov. Mead Treadwell, one of the state officials who has been leading Arctic policy efforts, in an email. Treadwell said one of the proposals from the Arctic Marine Shipping Assessment includes a mandatory code defining what kind of ships can make these voyages. “The new government [of Norway] will not go on with any planning or drilling in the waters outside Lofoten, Vesterålen and Senja, and will not open for drilling in the areas around Jan Mayen or close to the ice-edge in the High Arctic. The Arctic waters already opened for oil and gas planning and development in the southwestern and southeastern part of the Barents Sea will remain open for petroleum activity. Several discoveries of both oil and gas have been announced in these areas over the last two years. General Director of the Norwegian Oil and Gas Association, Gro Brækken, says the decision to stop any new impact assessment studies for oil and gas development in the northeastern Norwegian Sea is a democratic problem. She sent out a press-release pointing to the fact that three out of four deputies in the new parliament is elected on a program that says yes to study the impact of oil activity in the waters outside Lofoten, Vesterålen and Senja. 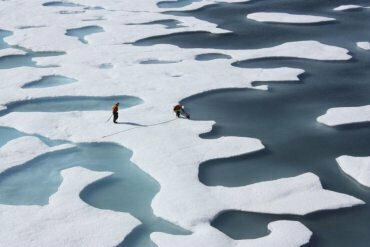 “One of the crown jewels in the federal government’s Arctic strategy is mired in a slow-moving environmental clean-up and the threat of legal action, federal documents reveal. The deep-water port at Nanisivik, Nunavut, remains under the control the federal fisheries department six years after Prime Minister Stephen Harper announced the creation of a naval refuelling station high in the northern archipelago. Environmental remediation of the site is necessary before the Department of National Defence can take possession. But a private company which operated a now-defunct zinc mine in the region has yet to complete a clean-up of a fuel tank farm, despite four years of pressure from the military. A 2009 briefing note to former defence minister Peter MacKay, obtained under access-to-information legislation, warned that delays by the company were a major risk to the project schedule and cost. http://www.bbc.co.uk/news/world-europe-21119774 Can Russia raise a K27 Submarine to extract intact uranium? 21.5bn tonnes of oil and gas reserves expected to be here and Russia doesn’t want any radioactive hazards to get in the way of contracting. Our greedy grab for oil again wins out over pristine Arctic water. By raising sunk submarines, radioactive hazardous materials containment may be breached and seep into our oceans contaminating sea life and surrounding coastlines and fisheries.